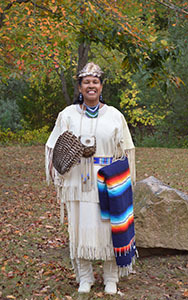 I am the Daughter of Chief Hockeo, Running Deer, Sachem for Life of the Eastern Pequot Tribal Nation, and Virginia Whatley Sebastian, Rose Basket, a Cherokee descendant. I am an educator and a lawyer, and am married to Brian Dring, chemist and musician. We have two sons, Sean, an engineer and Ralph, Sequoyah, working in Pequot archaeology and retail management, a daughter in law, Rebecca and a granddaughter, Willow. I am proud to be an Eastern Blanket Dance Champion and participate in tribal cultural ceremonies with Chief Hockeo. I served on the Tribal Council from 1971 – 1973 when the tribe filed its letter of intent with the US Department of the Interior, Bureau of Indian Affairs (BIA) to become a federally acknowledged tribe. I also worked with the petition team when the tribe received its preliminary positive determination in 2000 and again when it received its positive final decision in 2002. I have also represented the tribe at Congressional and BIA federal recognition hearings. While serving on the Tribal Council from 2000-2007 and 2012-2016 I spearheaded programs in natural resources, preventative health and historic and cultural preservation. I procured grants through the US Department of Health and Human Resources in federal status clarification, environmental regulatory enhancement and emergency services. I have served as Tribal Chairwoman since 2015 and am working with the Tribe, Council and James Benny Jones Jr., Esq, Tribal Elder, on reservation development and to regain our federal recognition as the Historical Eastern Pequot Tribal Nation.